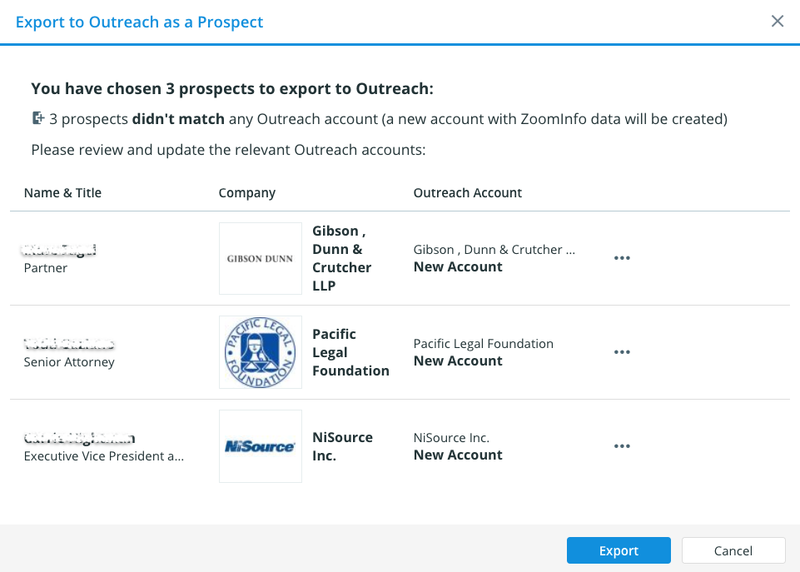 You can export directly to Outreach from Contact Search, Company Search, Target Accounts, My Contacts, and My Companies. To learn how to export from our Chrome Extension, ReachOut, visit our tutorial here. 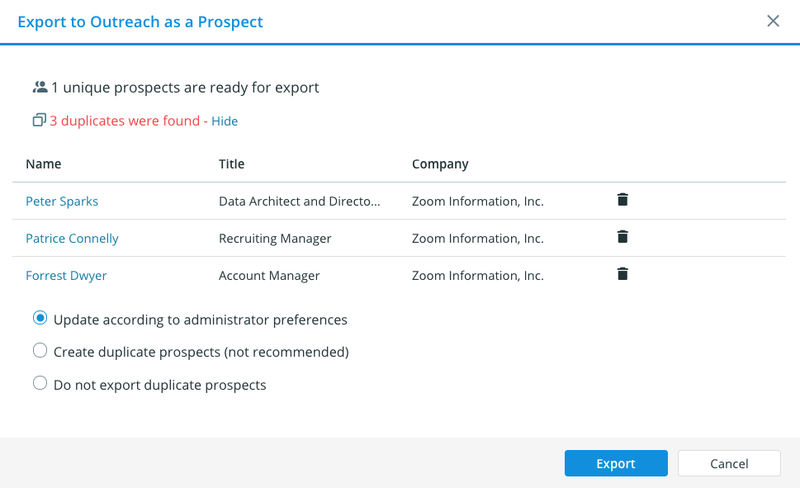 Our integration currently supports exporting prospects and companies from ZoomInfo to Outreach. After building a list/finding ideal contacts, select the contacts you want to export to the left of their collapsed card. Click Export in the top navigation bar and select Outreach from the drop-down menu. First, we'll identify if the selected prospects belong to an existing Outreach account. When an account does not already exist, we'll note that it's a New Account. 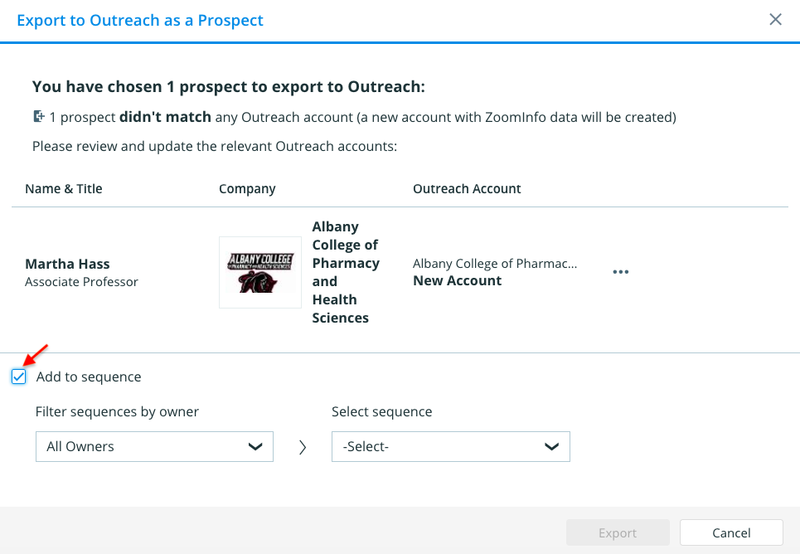 If you want to continue exporting the contact and add the new account, click export and data credits will be deducted for the number of contacts as well as the number of accounts we've created in Outreach. If the account exists, it will be listed under the Outreach Account column. If we match to multiple accounts, select the account from the drop-down menu. To send to a different account than we have identified, click on the ... and select Search in Outreach. Next, we'll identify if the selected prospects are already in your Outreach. If duplicates are detected, you'll have the option to only update based on the admin preferences, create duplicate prospects, or not to export duplicates. Within the Export pop up, check the box next to Add to Sequence. Select the company(ies) you wish to export by checking the box to the left of the collapsed company card. Then, click Export in the top navigation menu and select Outreach from the drop-down. Note: you can click on this message to go to the new account in Outreach. 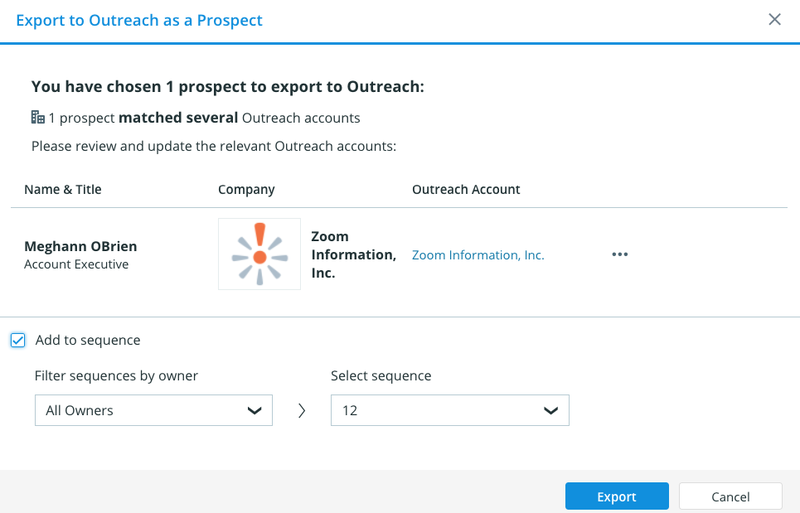 ZoomInfo will also adhere to any duplicate catching rules within your Outreach environment. If you receive a failed to export notification and we didn't match to any existing accounts or prospects, please reach out to your Outreach administrator.